We produce engaging and helpful content for three monthly ezines that are distributed to Aviva’s opted-in customer database. We also design infographics each month to get messages across in a clear and playful way. 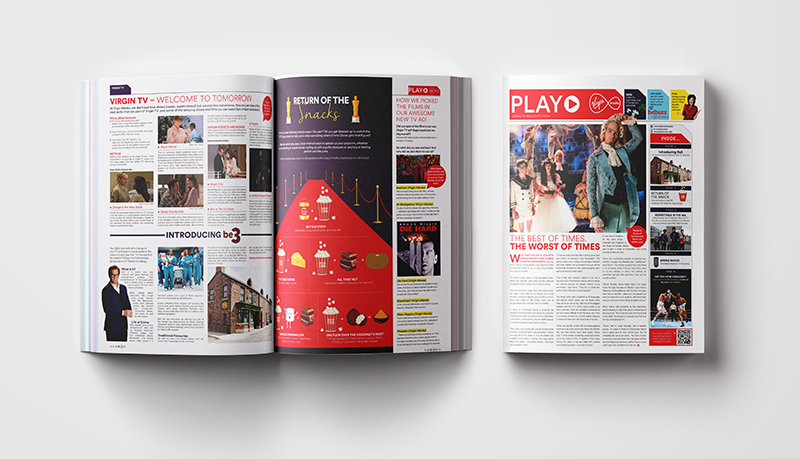 "We strive to give customers the entertainment news they want and that helps them really get the best from their Virgin Media services – Play magazine has become a key part of this. Zahra Media’s experience in both the consumer magazine business, as well as in content marketing, made them a super publishing partner for this project. The team at Zahra are a pleasure to work with who really get what we want to deliver through our customer communications and tone of voice. Now on issue 2 I have to say we are thrilled with the magazine so far. It’s vibrant, engaging, a great read and really brings a new dimension to how we keep the conversation going with our customers!" We produce this bi-monthly 12-page tabloid-style magazine that goes out to all Virgin Media customers who have opted into marketing communications. It is filled with pertinent entertainment content, covering TV and film listings, celebrity interviews and news on Virgin Media’s products and services. There is also a mobile-optimised html digital edition which is distributed via email. Read the in-depth case study here. "You can be guaranteed to get outstanding personalised service when working with Gina and her team at Zahra. Gina always takes a personal interest and closely manages our projects ensuring they are delivered on time and often ahead of schedule. What is unique about Zahra’s offering is their attention to detail, innovative ideas and solution focus. They take the hard work out of producing material for a brand, they constantly show initiative and come up with creative solutions to any challenges especially when it comes to sourcing and managing the relationship with industry and subject matter experts on our behalf." 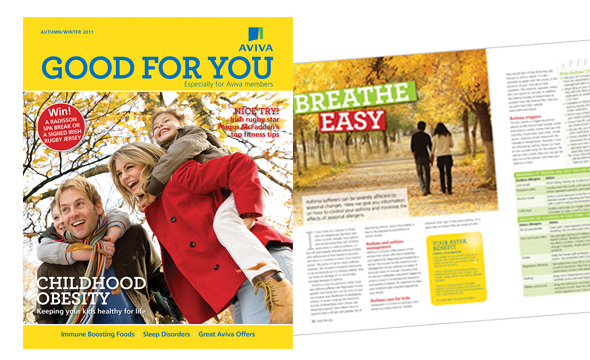 This 28 page magazine that we produced was mailed quarterly to Aviva Health Insurance customers to increase brand engagement and customer retention. We produced this thought leadership newsletter that was distributed via the Irish Times, brokers and affiliate partners. It was designed to position Davy Select as a leading expert for customers looking at their investment options.